This small circuit empowers you to use both, serial and parallel, outputs of your batteries in your projects. It basically employs a commutator. For most of us who use Lithium-ion batteries for powering up our projects, a common issue arises by and large, and that is when we require power output greater than 3.7V. Though it may be simply evaded by wiring two or more batteries in series and regulating the output afterward, yet it leads to another issue, and that is the charging process. Since most Lithium-ion charging modules are meant for charging only one battery, i.e 4.2V charging voltage, therefore we get are stuck with this inability to charge our project and we better call Houston to fix it. But should we really? 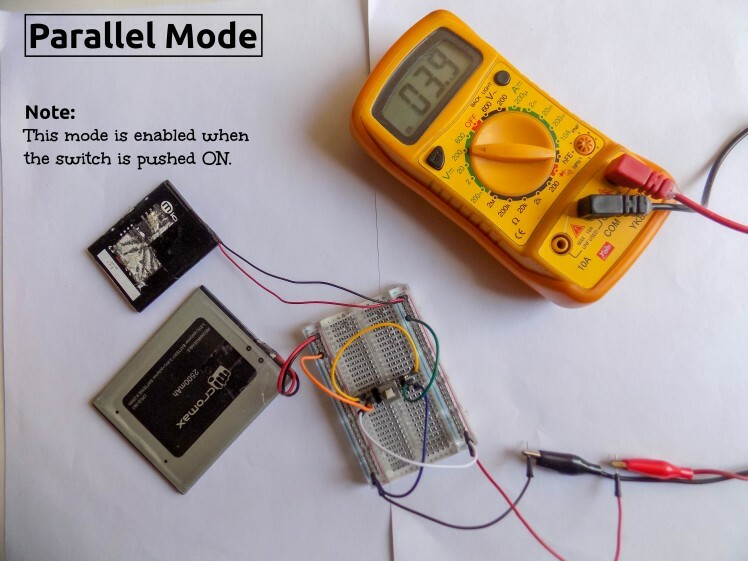 To solve this, wouldn't it be better if there was some small contraption or device which would switch the battery connections mechanically between serial and parallel based on a simple, hassle-free mechanism? Well, luckily, "Where there's a will, there's a way!" and so we have our solution here as well, and that is what this tutorial covers. In this post, we'll be looking into a mini, modular circuit, devised by me, which allows easy toggling of battery connections based on the pushing of a handy 6 Pin DPDT Switch. I call it Boggler! 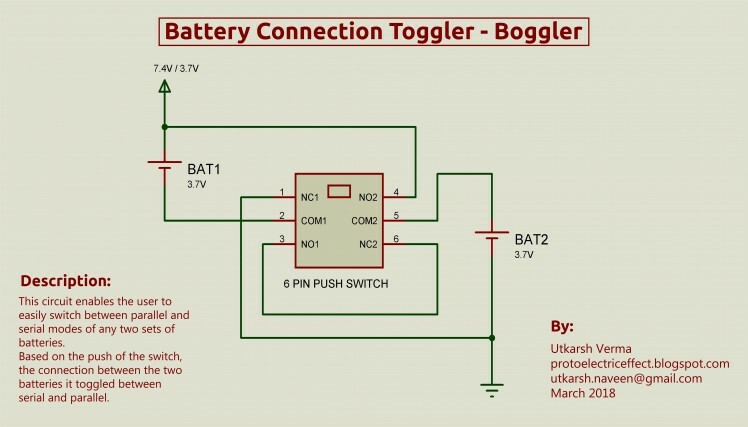 I'd also like to add that Boggler isn't a module, rather it is a circuit block which may be integrated within other projects. Its implementation in other projects is as easy as soldering a resistor on top of the other because this circuit requires only a switch worth of space! 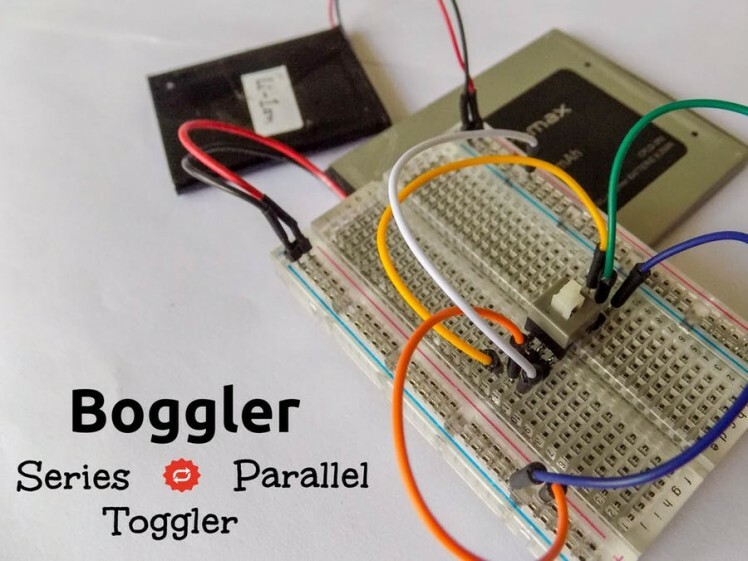 What Boggler does is it employs the switching action of a commutator to toggle battery connections between serial and parallel. Based on only a single component. Adapters of higher amperage are required for faster charging of the batteries. In terms of working, Boggler is very much alike to Convertendo, another device which I had made earlier. Although I'm only referring to the charging issue here, this device may be used in various other scenarios where serial to parallel toggling is required. The circuit is centered around a 6 Pin DPDT Push Switch which is capable of toggling to poles simultaneously and gets self-locked as well. For this circuit to work, you have to wire your multiple batteries in such a way so that you finally end up with two sets of batteries. For example, two serially connected pairs of parallel connected batteries each yields two sets. Adding to the above-stated example, this circuit will provide two modes of output with respect to the ON/OFF states of the push switch. In the ON state, the two sets of battery sets are connected in a parallel fashion so the output voltage would be equivalent to that of a single set, so you can easily charge both sets now. This mode is also useful for solving brownout issues. In the OFF state, the battery sets are connected serially so the output would be the sum of the voltages of the two sets. 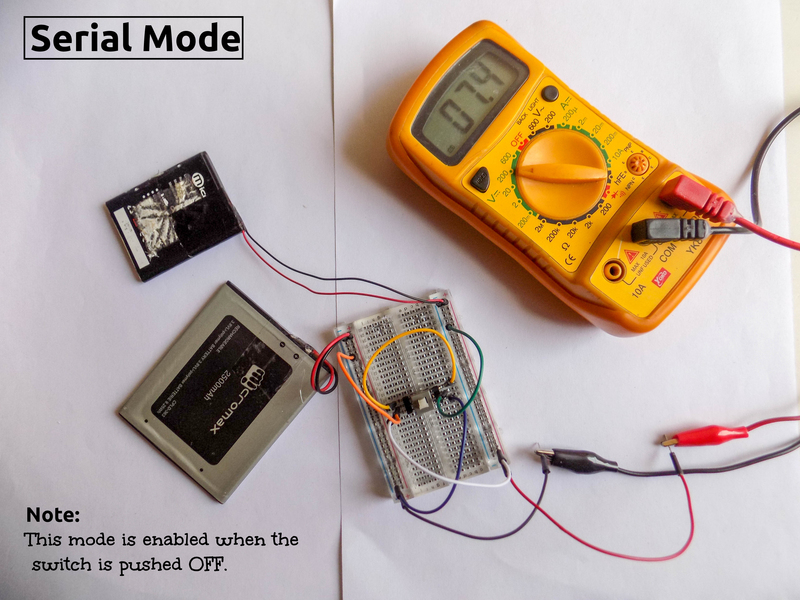 This mode is for powering up your project which requires serial output of the battery sets. To test and demonstrate this circuit, I have breadboarded this circuit and used two Lithium-ion batteries. As shown in the pictures above, the output differs in both modes, i.e. 7.4V in OFF state and 3.9V in ON state, which is as expected. The implementations for this circuit go as far as the maker's thoughts. What drove me to devise this circuit was the charging issue which I was facing with my Lithium-ion batteries powered line follower robot which required the serial output of my batteries. The scenario was identical to the one stated above in the introduction, so I came up with this circuit and am now using it in my line follower robot. The video below shows the charging module(TP4056) glowing, indicating parallel output and turning OFF during serial output. As you can see, Boggler occupies only a switch worth of space. The rest are all wires connected to the batteries aerially. That's it for this circuit's demonstration. If you have any doubt, feel free to comment. Don't forget to follow me if you liked this post. You can also support me on Patreon. This schematic is made using Proteus.